To help prospective students to understand what sort of work they would be expected to do in Psychology and to give me a chance to assess their skills and motivation, I ask any student who does not meet our recommended GCSE requirements to complete a simple worksheet then discuss their answers with them. This worksheet involves some basic data analysis, application and critical thinking but it also asks the students to reflect a little on themselves. There are no marks on the sheet, and I don’t use it to make a simple “yes-no” decision about whether they should start the course. Instead, I ask them to do the tasks, then have a quick talk about their answers and give them some feedback on their answers to get a sense of their motivation and give them a chance to reflect on whether this is how they want to spend their next two years. The first task I ask them to do is some simple data analysis – working out the mean and median of some data, then using the results to draw a conclusion. It is surprising how some people react to this. In the past, the mere sight of numbers and the idea that they might have to do some writing has been enough to put off some prospective students. There are still a few who think that they will spend their time in Psychology talking about their life experiences and open discussions of anecdotes, so some early awareness that they will have to do some academic work is a valuable insight. Responses to the calculation task are interesting too. Most students realise that all they need to do is take the totals that have been calculated for them and divide them by 10, then identify the fairly obvious mode. Others manage to do all sorts of interesting things with the numbers – one common mistake being to add up the participant numbers because they don’t think about the task before starting – and some will get answers right then doubt themselves and change their answers. If they realise the task is simple, that is obviously a good sign, but I am really more interested in how the students who struggle deal with the task they find difficult. In the long run, some of my most motivated and often most successful students have been the ones who admitted that they were not confident with this task, asked for help and then were willing to use my guidance to work out the answers. Similarly, most prospective students are able to observe that one set of means and medians is larger than the other, but I am more interested in seeing how they use that information. If they make up potential causes for the difference that go far beyond the data, I ask them about their thought processes, but warn them that we have make a clear distinction between what the evidence shows and what we might speculate. If they don’t refer to the numbers, I advise them of the importance of precision and guide them to comment on how confident they might be in the answers and what they might conclude from the difference between the means and modes. Overall, however, I am most interested in introducing the idea that they must always think about how data relates to a theory and remind them to think about how the data relates to the researchers main aim. If a student seems motivated by the idea of learning more about research like the study but has struggled with the maths or relating the results to the researcher’s aim, I might try to get some insight into their practical thinking skills by seeing how they respond to questions about whether it was a good idea to have different participants in each condition or if they can think about anything they would want to improve in the study. I would advise all of them that it is very important to think critically in Psychology and that they must always look for flaws in research or theories and must never take anything for granted. The application task is another simple question that has the potential to help prospective students learn a lot about what they will do in Psychology. By introducing the concepts of classical conditioning and operant conditioning and asking them to identify the type of learning being displayed in different cases, it shows them that they will have to deal with somewhat complex terminology and that, rather than simply knowing information, they will have to be able to use it in new situations. It is also a chance to introduce a real theory so that we can get them to think about it critically in the next section. Almost everyone gets the answers right, so I ask questions to find out whether they seem interested in learning more about the theories. I usually start with a quick question about how they identified the right answers, but then point out that they would be expected to know the definitions of classical conditioning and operant conditioning when they take the exam and ask how they feel about having to learn lots of theories and definitions. If they have not done well in subjects that require learning of large amounts of content, I might ask why they think they did not do well and what they could do to help them learn the large amount of content in Psychology. If I think a little more probing is worthwhile, I might ask the students to talk through their thought processes while deciding which of the cases involves punishment and which one involves reinforcement. I use this as a prompt to explain to them that it is not simply enough to give the right answer, but that they must also be able to justify their answers if they are going to do well. Later in the year, many of the students who work through these examples enjoy a little boost in confidence when they find that they know something about Behaviourism before the rest of their peers. In the critical thinking section, I ask students to describe a situation in which they overcome a problem then ask them to use their experience to reflect on the value of Behaviourism. It is surprising how many students require some prompting to think of a situation in which they have overcome a problem. This is important because it allows you to discuss how they have dealt with difficulties and to gain some insight into their resilience. It gives both of you a good opportunity to reflect on how much responsibility they are likely to take for improving on their performance in the GCSEs and dealing with the more complex challenges they will encounter in Psychology A Level. Most prospective students find it very hard to think about how their example relates to the principles of Behaviourism, so don’t be surprised if this question is left blank. Again, use it as a chance to help them reflect on their motivation, but also remind them of the need to think critically. 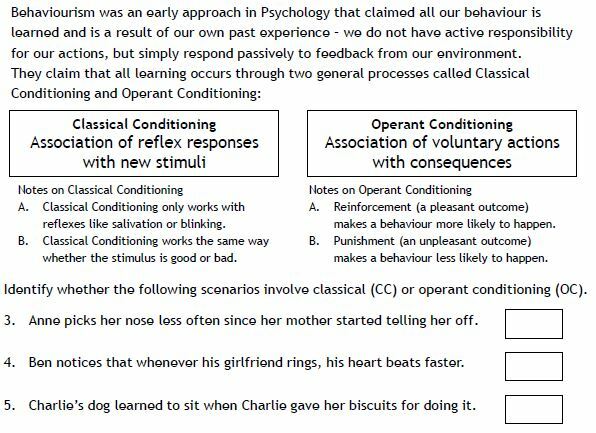 Any case in which we plan a solution contradicts Behaviourism, but most students will try to use it to support the theory and try to explain it in terms of classical or operant conditioning. The final question also allows you to ask them to reflect on whether they think they have active control over their lives or simply respond passively to feedback. It is obviously loaded, because any case of planning contradicts Behaviourism, but it is a surprising logical challenge for a GCSE student who has just had a six week holiday to try to use an example to contradict a theory. Most will fail, and if you discuss it with them, then you will find that most are trying to explain it in terms of classical or operant conditioning. As with most of the other questions, you have to make it clear to them that you are more interested in their reaction to the question and thought processes than whether they could get the answer right and use their answers to help them make a decision about whether they will enjoy spending most of the next two years thinking about what is wrong with theories rather than simply learning to describe them. In most cases, any student who is willing to complete the examples, shows some interest in learning more about the topics and appears willing to pay attention to feedback is likely to have the motivation to become a good student. On top of that, the little bit of knowledge and handful of tips they have gained before their peers may give them a little extra confidence once they begin the course. 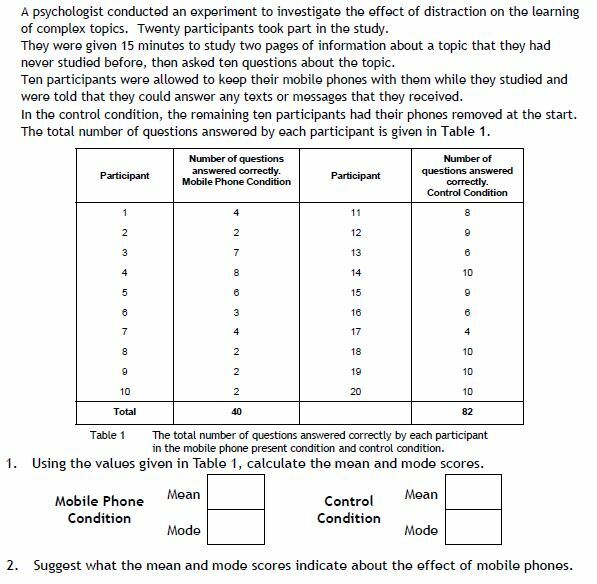 And finally, I’m a big fan of Festinger’s work on cognitive dissonance and like to believe that if we appear to make it just a little harder for some students to get on the course, they will feel a little extra motivation to try harder once they are on it. Like Groucho Marx in the quote at the beginning of this blog, students who feel that they have had to pass a challenge to get on the course may also give more value to the opportunities they are given.